Today is the day that many an athletic young man or woman will make a decision that will significantly affect the rest of their lives - National Signing Day. Of course, many a top, blue chip recruit on the track to the pros has their pathway through college paved with gold (as many a scandal will prove); but, they're hardly the majority. Speaking as a former collegiate athlete, the factors at play are overwhelming and downright terrifying for a 17 or 18 year old kid. The pressure of choosing which educational institution you will spend the next four or more years (and rest of your life paying off, without a full ride) can be crushing and that decision is a seminal moment for the decision maker. My cross country/track & field scholarship wasn't exactly Big 10 money and attention, but signing on the dotted line is scary, no matter what. This is your future. 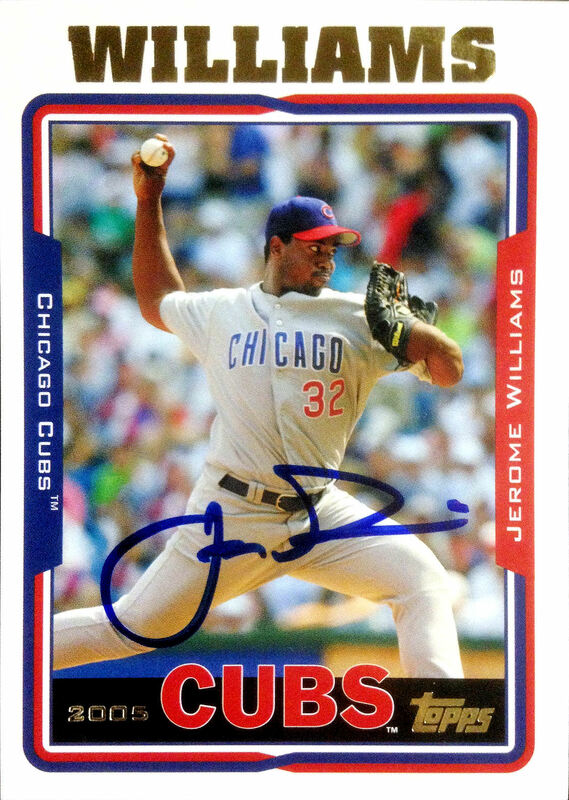 On a lighter note and not entirely related note, my Cubs All-Time Roster Collection consists of 45 autographs and I have maybe a dozen more scattered throughout other areas of my card collections. Of those signatures, all but a few of them have already made an appearance on Wrigley Roster Jenga. Seeing as National Signing Day is all about signatures, this seems like the perfect segue into showing these 12 John Hancocks off on the blogosphere. Okay, maybe not perfect... but, it'll do. 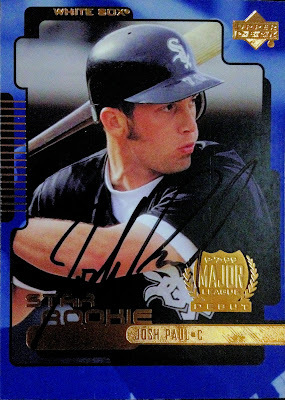 Here's a pair of cheap autos that I picked up from my local card shops for chump change and couldn't come up with a proper tie-in for blog showcasing. Donruss' Angel Guzman was a live armed prospect who was supposed to team with Prior and Wood to bring the Cubs to the promised land. Like those two, Guzman never was healthy enough to achieve his true potential, though he did have one decent year as a reliever. Meanwhile, Austin Jackson was brought in for the stretch run of the 2015 playoff race and never received a Cubs card for his troubles. Thus, this Tigers card from BoChro will have to do. 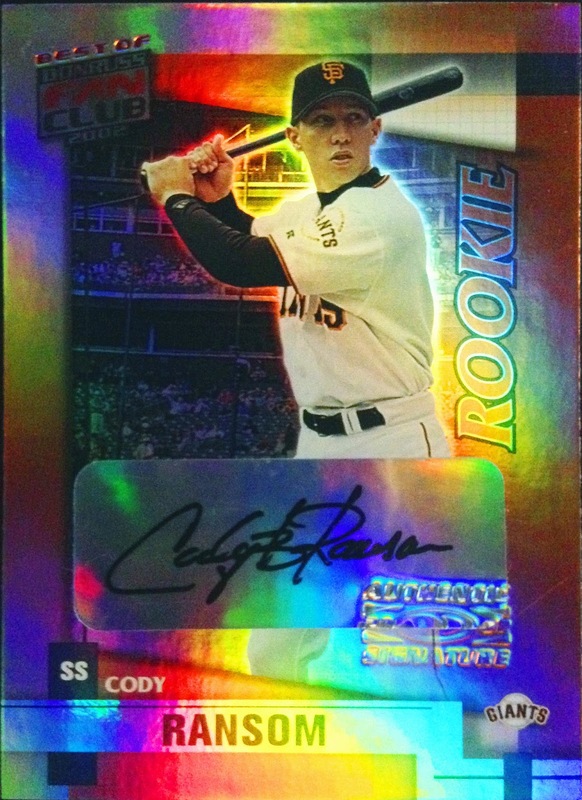 It may be hard to tell, but there is a certified autograph from Cody Ransom on this 2002 rainbow, reflective Donruss Fan Club hit. I pulled this from a Fairfield 100-count repack a few years ago and couldn't believe I pulled a hit that fit into my collection. This was in the pre-blog days, though. Ransom was claimed off of the junk pile during the 2013 season, in thick of the rebuild and was surprising useful, smacking 9 homers in 57 games. 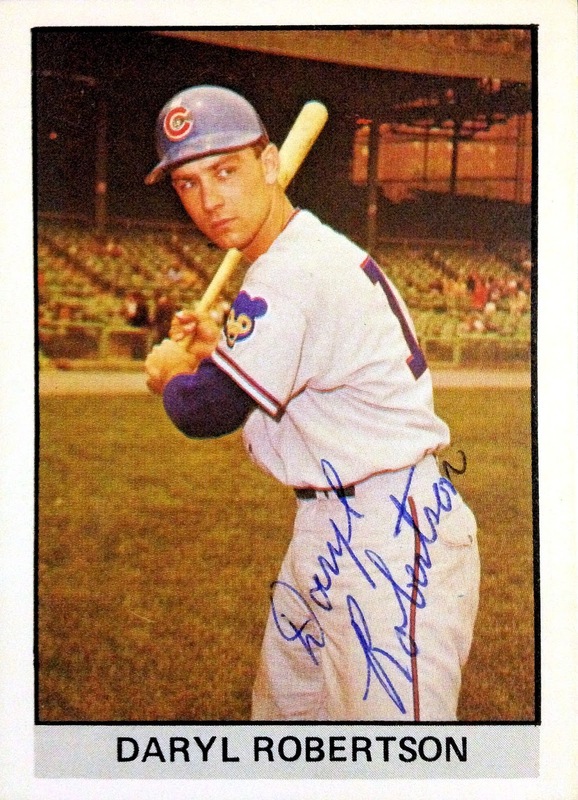 Again, despite his contribution, he never appeared as a Chicago Cub on a card. 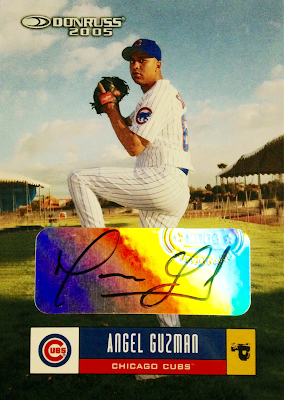 That said, he does have an Iowa Cubs card, dating from his first tenure in the Cubs org, in 2005. Speaking of minor league cards, here's a couple IP-signed examples, from Classic Best, that I found on Ebay, for a buck shipped. It's hard for me to pass on that kind of deal. Neither one of these men stayed with the Major League Cubs for very long - Steenstra got into 4 games in 1998 and Swartzbaugh snuck into 15 games from 1995-97. Neither one of them posted pretty stat lines either. I guess that would explain why I was able to score their signatures for such a low price. 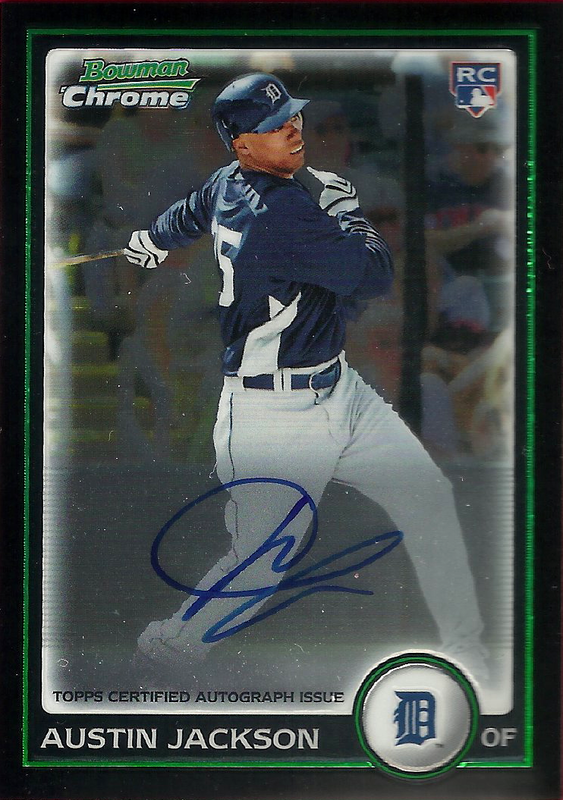 Sticking with short-time MLB'ers, this is a card that I would have been happy to track down with or without ink. You see, this "One Year Winner" collector's release is Daryl Robertson's only appearance on cardboard, making it a coveted and needed item for my CATRC. The fact that I found a signed copy was just an added bonus. I think it was another Ebay win. In 1962, the shortstop worked his way into 9 games with the Big League Cubs, batting .105 in 22 PA's. Next up, we have a pair of mid-00's Cubs hurlers who had better success outside of Chicago. But, during their time in Windy City, my LCS was able to draw them in for autograph sessions and had them sign a few extra cards to sell later one. I didn't make their sessions, but I did end up with their autos anyway... and I didn't even have to pay for a ticket. 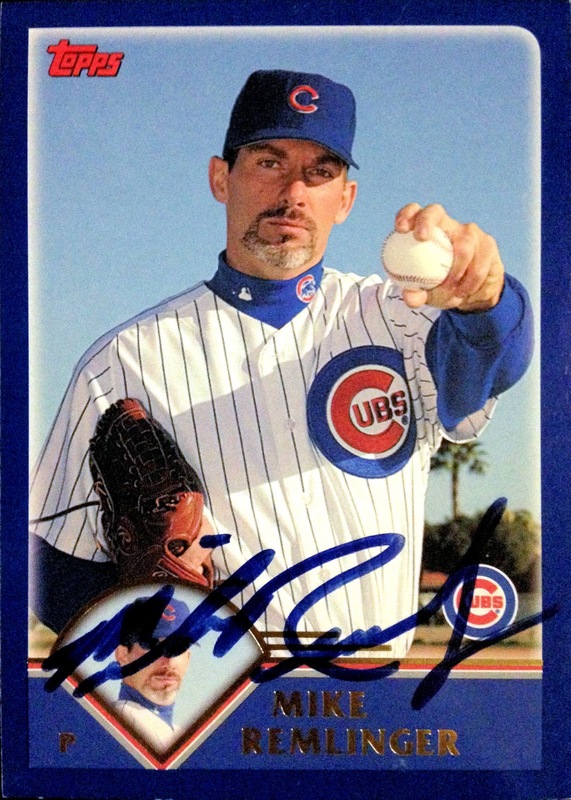 Mike Remlinger was a top-notch set-up man with the Braves and then a mediocre middle reliever/LOOGY with the Cubs. 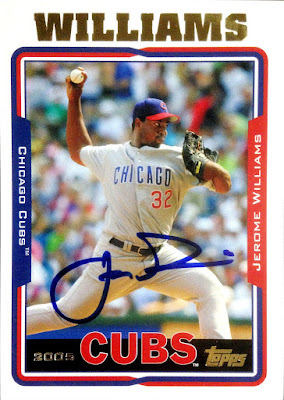 Jerome Williams, a playoff pitcher with San Fran previously, made a few starts for Chicago in 2005-06. Believe it or not, his journeyman career is still journeying. This John Hancock comes courtesy of long-time reliever Paul Assenmacher and the Volo Auto Museum antique malls. Located in Volo, IL, this museum is a parking lot of classic and, even more fun, star cars - i.e., the Gadgetmobile, Herbie the Love Bug, the Mystery Machine, etc. In addition to the famous automobiles, the museum has four or five barns, stuffed to the gills with antiques and resale items. 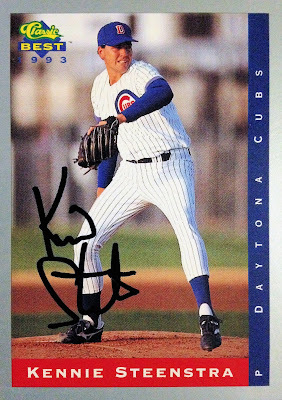 After a long day of admiring Bumblebee, KITT, Eleanor, I was thrilled to come across a binder filled with Cubs cards, including the IP-signature above, in one of those barns. It made for the perfect cap on an already fun day. Finally, these three IP autos came into my collection as a way of filling out purchases from my LCS. 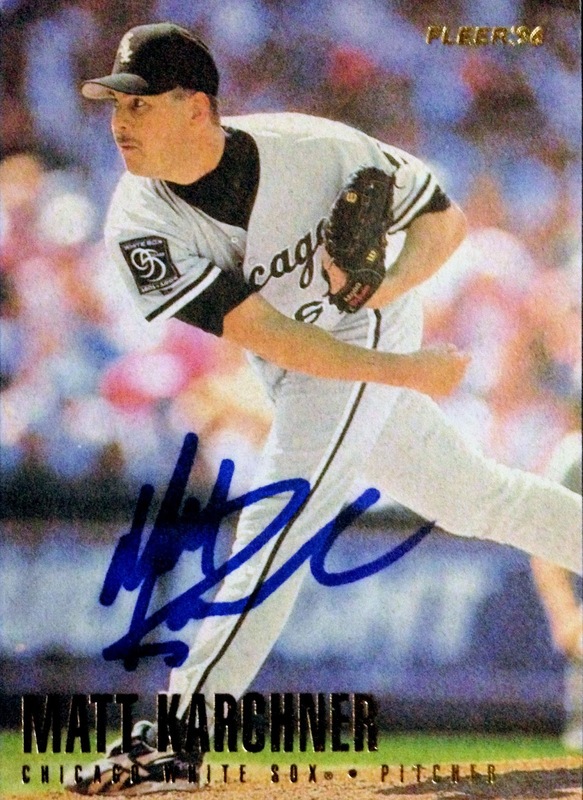 I always feel silly and cheap when my desired purchases amount to less that a McDonald's value meal and the shop owner used to keep a binder of miscellaneous, bargain signatures on one of his display cases, in hopes of catching impulse buys. So, every now and then, I'd grab myself one or two to help assuage my tight-fisted insecurities. All three of these men spent a little bit of time on the North Side; obviously, Karchner and Paul spent some time on the South Side, as well. 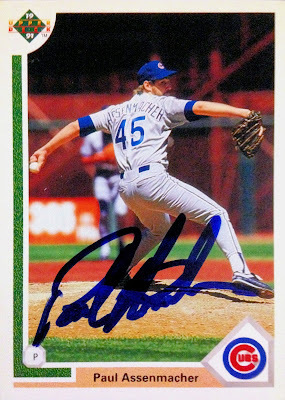 Bonus points to Barberie for his Classic card featuring Wrigley Field as a backdrop, even if his auto is a touch smudged. Whoops. So, there you have it. Now, on National Signing Day, all of my signatures have been shown off on Wrigley Roster Jenga. 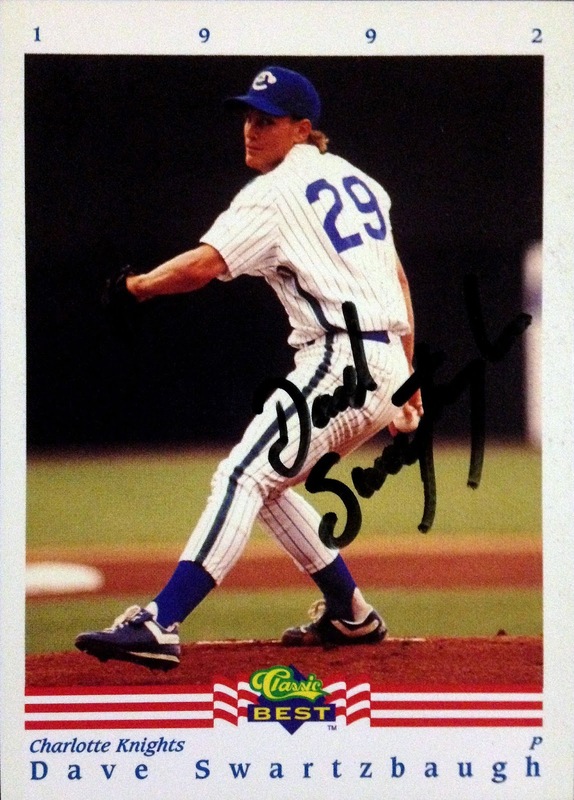 As young men and women, across the country, are making decisions that will shape the rest of their lives, I'm blabbering on about inked baseball cards. Like I said, it's a tenuous connection, at best. If you or a loved one is behind one of those pens today, my well-wishes go out to you. Meanwhile, today might be National Signing Day, but February 1st is a significant day on the calendar for yet another reason - 2017 Topps Flagship release day! 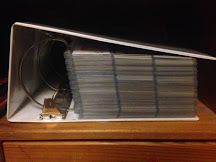 I may just have to wander over to one of my card shop haunts after work and celebrate accordingly. A Signing Day post! Well done! When I was still living in Chicago I went to Volo a number of times. I mostly bought Peanuts collectibles there. The last time I went was with my wife and her sister. My sinuses really had trouble with the mustiness. For anyone in the area I do recommend it. There's a ton of stuff there. I'm not a car guy but I did once walk around the bog. Of course it was in the middle of summer and I didn't bring bug spray. Pretty dumb.